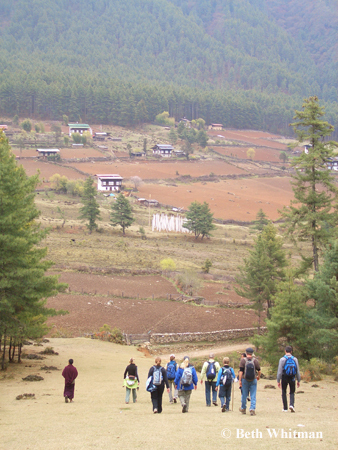 Perhaps you are considering or have already registered for a WanderTour to Bhutan. Please read on to learn some general information about the Kingdom and these unique small-group tours. See recommended books about Bhutan. Bhutan is located in the Himalayas… but you knew that. What you may not have considered is that this means you’ll be at elevation the entire time (at least 4,000 feet and up to 11,000 feet on some days). This should not be an issue for most, but smokers, those not in good physical condition, and others with any respiratory issues, may have a more difficult time catching their breath, even when you’re not out on a trek or walking in the foothills. This is not meant to scare you – only prepare you that you may not be able to partake in all the hiking activities. 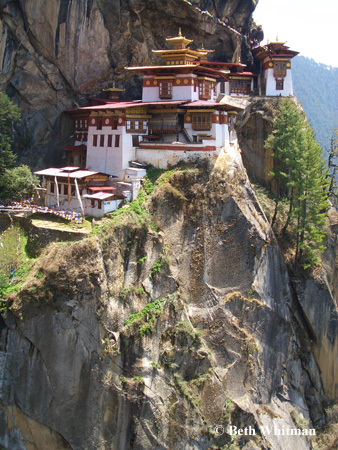 You’ll be hiking to monasteries like Tiger’s Nest, directly above. Approx. 11,000 ft. 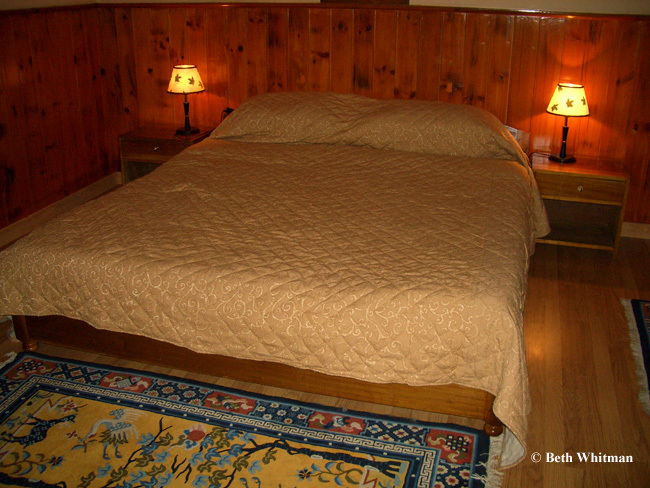 The better physical shape that you are in upon arrival, the more you’ll enjoy the trip. But don’t worry, you won’t be left behind and there’s always a vehicle close by that can take you back to the hotel or to the next destination, if need be. If you are prone to headaches, you might consider carrying some pain reliever as high altitudes can bring these on. 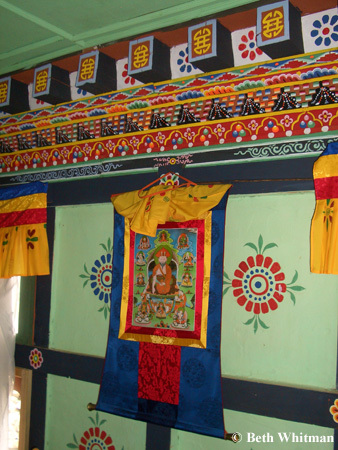 The vast majority of Bhutanese are Buddhist. They are a kind and gentle people who have had little exposure to the world beyond their own border. Because this is an organized tour (and all visitors to Bhutan must be on an organized tour), there won’t be as many opportunities to “mingle” with the Bhutanese as you might have experienced on other trips. Sensitive to the fact that travel is always more interesting when you can meet the locals, we’ve tried to build in opportunities for you to get closer to the people than might normally occur on a trip to Bhutan. 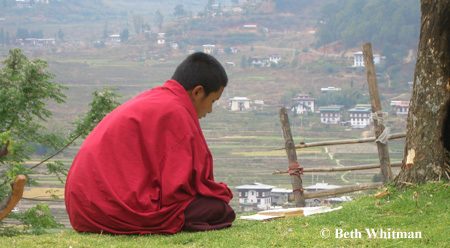 It would be beneficial to do some reading in advance in order to understand the Bhutanese. Check out these recommended books. 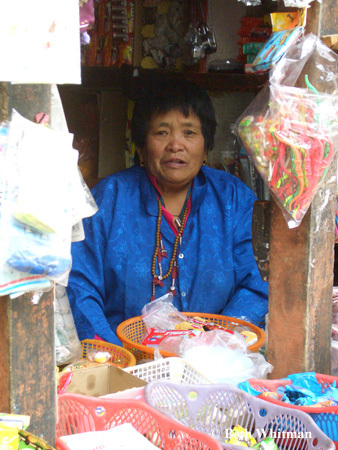 Vendor at a small shop in Wandue. Tsechu (festival) near Bumthang. 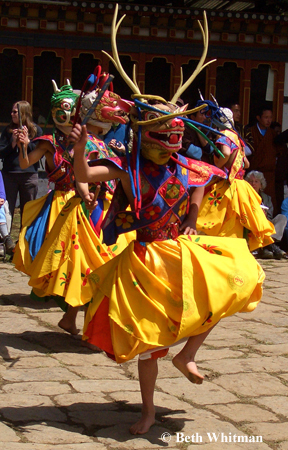 The Bhutanese have maintained strong cultural traditions. Monks are a common sight throughout the country. Breakfast – toast, scrambled eggs, potatoes, fruit, juice, and milk. Lunch – rice, chili & cheese (spicy hot! 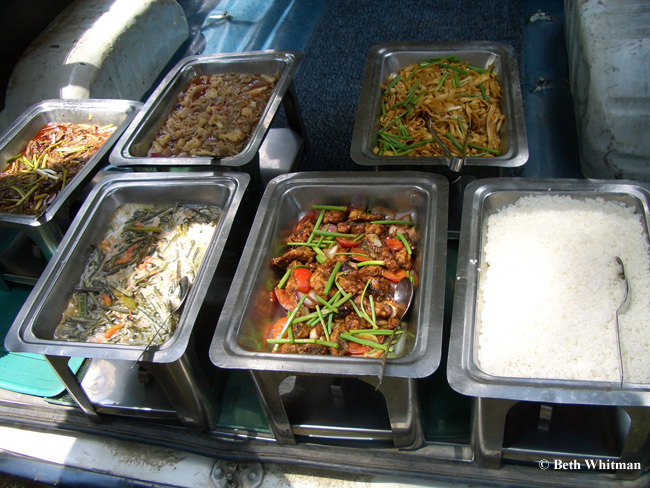 ), sauteed vegetables (including fiddlehead ferns), chicken and momos (Tibetan favorite). Dinner – rice, sauteed vegetables, potatoes, beef & noodles, chapatti (flatbread), and chowmein noodles. 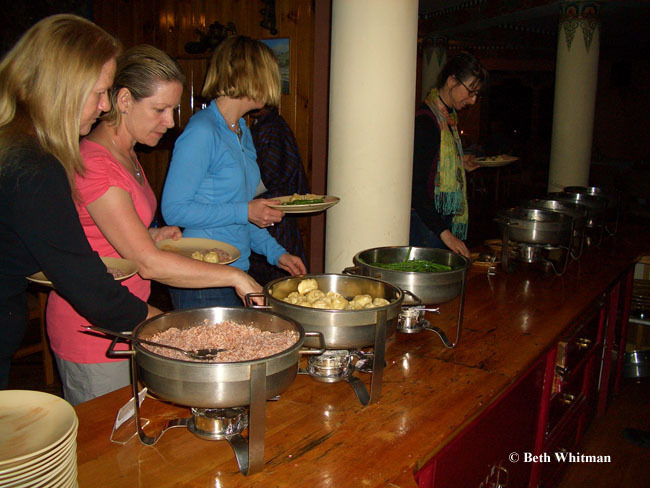 Snacks – tea, coffee, and cookies (served between meals depending on what the program is for the day). 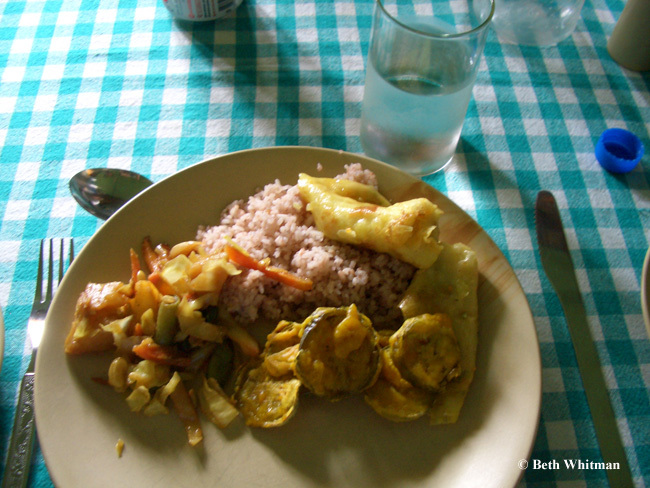 The cuisine draws upon the very fresh veggies that are grown throughout the country as well as spices and dishes from India, Tibet, and Nepal. If you’re a vegetarian, you won’t have any problems getting plenty to eat, though lunch and dinner might be a little lighter on protein than you are used to. Consider carrying some protein bars from home. You may have a few occasions to eat out at restaurants which will provide a nice change from the usual fare (though these are served buffet-style as well). Bottled water is included in the cost of the trip, but soft drinks, alcohol, and juice (unless it’s served at the buffet) are not. There will be plenty of things to spend your money on and you’ll have ample time for shopping. Common purchases of items made IN Bhutan include: tapestries, thangkas, traditional clothing, and some food items (such as tea and snacks). Bhutan is not a manufacturing-haven. Many of the items in the souvenir shops are imported from Thailand, India, and Nepal. And they are EXPENSIVE. Even items manufactured in Bhutan are expensive. For those of you used to shopping in the developing world, readjust your expectations here. You should feel free to leave a small tip for the waitstaff at the hotel and restaurants. While this is not expected, it’s appreciated. Please factor in a tip for your Bhutanese guide and driver(s). U.S. dollars are very much appreciated for this. At the end of the trip, the tip money is usually collected from the group and presented to the guide and drivers in one envelope each. This way, the tip is all rolled in to one generous gift. $5-$10/day for the guide and $3-$5/day for each driver is generally a good rule of thumb but please make your own decisions based on how well you think they served you and what you can contribute. Accommodations are quite comfortable, usually in the 3 – 4 star range (5-star hotels can be upwards of an additional $1,000/night!). These have private bathrooms, heat, and hot water. Some hotels will have TV’s in their rooms (and some actually work 🙂 while others will have wood-burning stoves. Suffice it to say that the accommodations will be varied and hotels are not confirmed until a couple of weeks before departure. (Due to the fact that there are so few hotels, there’s a lot of last-minute rearranging that we must do prior to the group’s arrival). The reality of Internet connectivity is that while hotels are now required to have WiFi and/or Internet, the connection is sometimes painfully slow or not working at all. You MAY be able to use your cell phone in Bhutan though it is likely super expensive. Check with your cell phone provider for details. You may be able to send/receive text messages for very cheap. You may want to bring it, just in case, but don’t expect regular calls from or to home. You can always bring it and only turn it on in the case of an emergency. Prior to departure, you will be provided with the cell phone number of your guide so that you can give it to your friends and family in case they need to reach you. 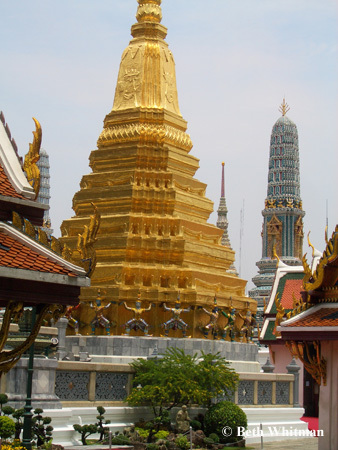 If you have joined a tour that is meeting in Bangkok, plan to arrive in Bangkok a few days prior to the departure to Bhutan. 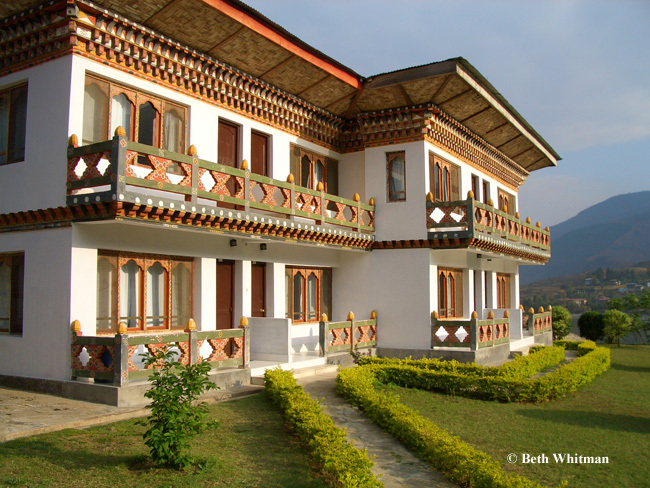 This will give you a little time to get over jet lag and to fully appreciate Bhutan from Day 1. The Sukumvit neighborhood gives you access to a ton of things to do as well as being very close to the Skytrain which traverses much of the city. The Skytrain is fast and cheap (particularly compared to taxis). 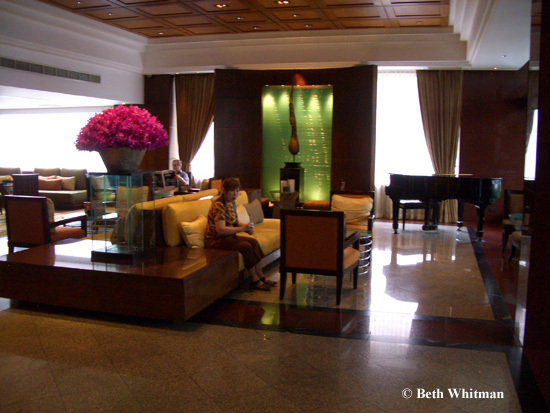 The Amari Boulevard Hotel is quite lovely and currently ranges from $70-120/night. In addition to beautiful rooms, there’s a pool and probably the best breakfast buffet you’ll ever enjoy. It’s centrally located so you can walk to a lot of activities but it’s quiet once you step inside. There are, of course, numerous less expensive options available in the same neighborhood. Pack as light as possible. Although you won’t have to lug your bags around much at all, if you can pack one carry-on bag (22″ or smaller) and one day bag – you’ll be far more comfortable than having to keep track of more than that. If you’re joining a trek, you may have extra clothes and gear that you’ll have to bring with you. No matter which tour you are on, the group will be moving around a lot in Bhutan, which means there’s a lot of unpacking and packing. The less you have to pack up, the more time you can spend enjoying the country, the people and the other participants. Consider bringing no more than two pairs of shoes, perhaps a pair of comfortable walking sandals for easier walks and day-use and a pair of hiking shoes for Tiger’s Nest. You don’t have to go hog wild with hi-tech hiking shoes as this is not rough terrain. Do dress in layers. You might be fortunate enough to have daytime temps in the 70’s but when the clouds come in, and at night, the temps drop and it can be quite chilly. Travel insurance – Covers you in case you need to cancel the trip for any reason. Usually must be purchased within a certain time period after you’ve made your tour booking or your plane reservations. Usually covers loss of luggage and other common issues as well. You may want to purchase this if there’s a possibility that you must cancel your trip at the last minute. Health insurance – Not all health insurance policies cover your travels abroad. Check with your provider to see if you are covered and to what degree. Evacuation insurance – While Bhutan does have some very competent doctors, if you have a serious injury (you break an arm, for example), you may not want to be treated in-country. You’ll want to fly to Bangkok and, perhaps home, if you have a more serious ailment. In this case, having evacuation insurance is absolutely essential. And evacuation can cost you upwards of $60K. Please, spend a few extra dollars on this.